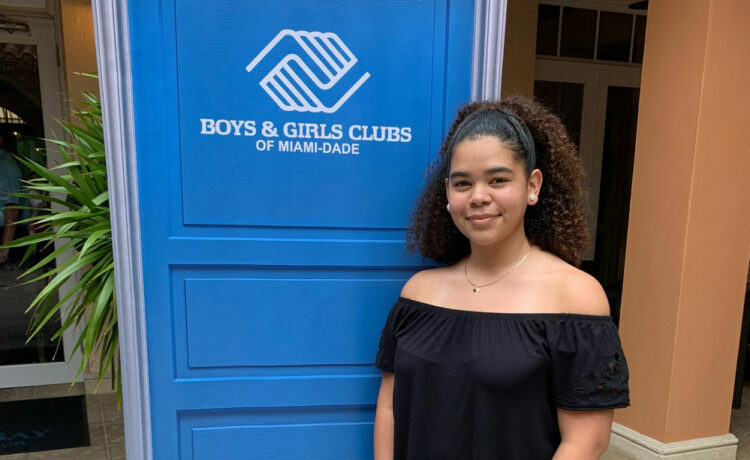 Tatiana Hernandez, 17, was recently named Boys & Girls Clubs of Miami-Dade’s 2019 Youth of the Year. A panel of individuals from a diverse mix of Miami-area companies ― including Norwegian Cruise Line CEO Andy Stuart and his wife Allison Stuart, Pedro Pablo Zarzalejos of Llorente & Cuenca, and former Boys & Girls Clubs of Miami-Dade Youth of the Year Ahbria Marshall ― served as the judges to select this year’s Youth of the Year. Hernandez, a senior at Miami Killian Senior High School with a 3.3 GPA, has been a member of the Kendall Club since her freshman year. During her time at the Club, she has matured by placing her focus on her education and giving back to the community. She hopes to attend an HBCU (Historically Black Colleges and Universities) and major in psychology, to eventually give back to the community that helped raise her. She and 29 other teens from Florida Boys & Girls Clubs will be competing for the 2019 Florida Youth of the Year title from April 11–14 in Fort Walton Beach, Florida. The winner of the state title will receive a $2,500 scholarship, laptop computer and printer. Every year since 1955, youth from various Boys & Girls Clubs across Florida have competed for the opportunity to represent Florida as the Florida Youth of the Year. The winner of the state title then competes in the regional competition. Five regional winners then move on, and one is named the Boys & Girls Clubs of America National Youth of the Year. The National Youth of the Year serves as both an exemplary ambassador for Boys & Girls Clubs youth and as a strong voice for all of the nation’s young people. He/she receives a new car courtesy of Toyota, scholarships and cash totaling $60,000. The National Youth of the Year, along with the other four regional runners-up, then travel to Washington, D.C. and speak to members of Congress and meet the president of the United States. To achieve the title of Youth of the Year on any level, Club members must embody the values of leadership and service, academic excellence and healthy lifestyles. They should exemplify the critical impact that Boys & Girls Clubs have on the lives of young people. The scoring includes candidate essays, an interview, a speech, letters of recommendation and overall application quality.